Sept. 17, 2018: An unusual infrared light emission from a nearby neutron star detected by NASA’s Hubble Space Telescope, could indicate new features never before seen. One possibility is that there is a dusty disk surrounding the neutron star; another is that there is an energetic wind coming off the object and slamming into gas in interstellar space the neutron star is plowing through. The observation, by a team of researchers at Pennsylvania State University, University Park, Pennsylvania; Sabanci University, Istanbul, Turkey; and the University of Arizona, Tucson, Arizona could help astronomers better understand the evolution of neutron stars—the incredibly dense remnants after a massive star explodes as a supernova. Neutron stars are also called pulsars because their very fast rotation (typically fractions of a second, in this case 11 seconds) causes time-variable emission from light-emitting regions. This is the first neutron star in which an extended signal has been seen only in infrared light. The researchers suggest two possibilities that could explain the extended infrared signal seen by the Hubble. 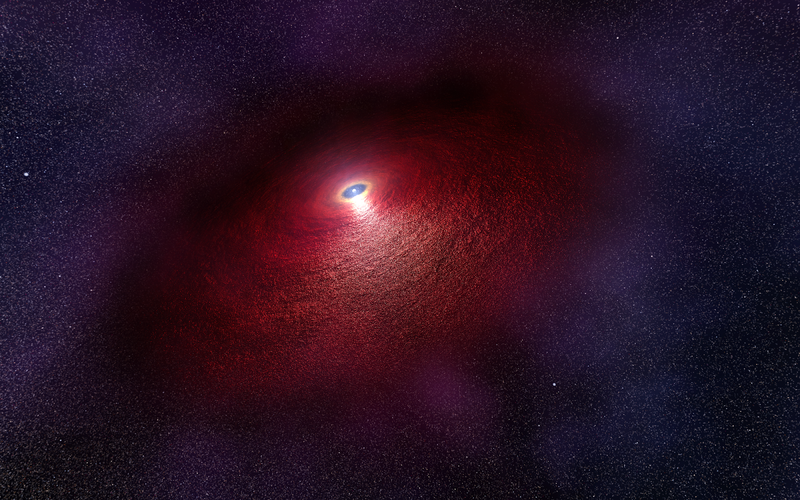 The first is that there is a disk of material—possibly mostly dust—surrounding the pulsar.